With the World Cup in Russia fast approaching, you're probably wondering how to keep track of your country (unless that country is the USA). 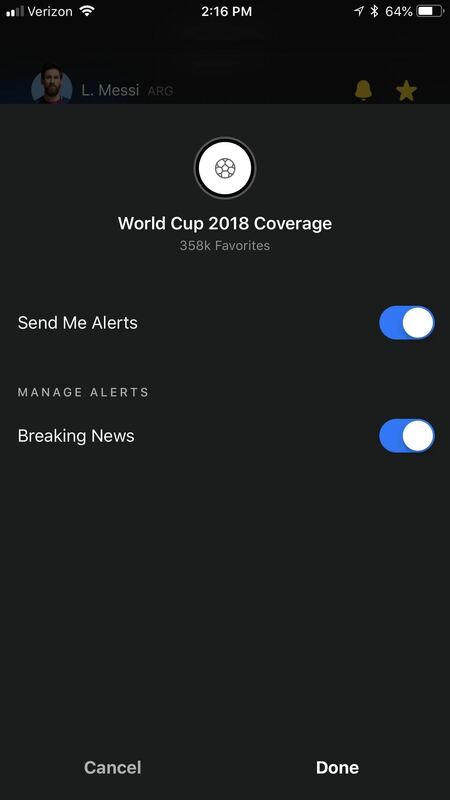 While there are a ton of apps that do just that, there's one that stands above the rest if you're looking for World Cup coverage — and it's not ESPN, Yahoo, or CBS. 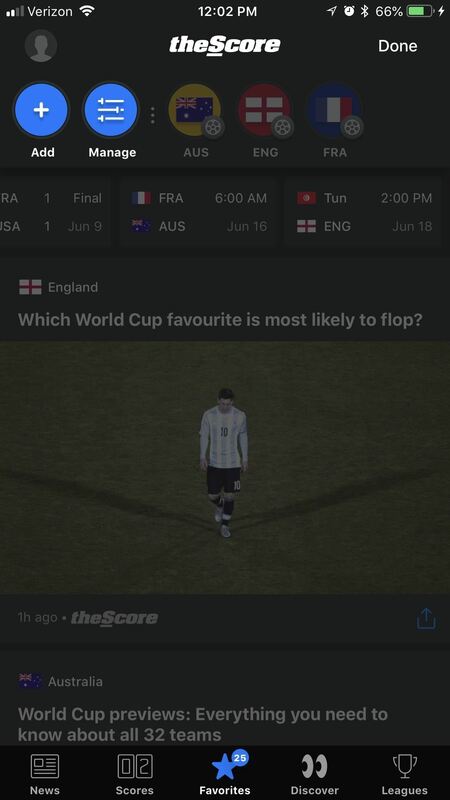 After testing several apps, the best option we found for tracking World Cup progress was theScore. It strikes the perfect balance between simplicity and usability while still managing to pack in the features. 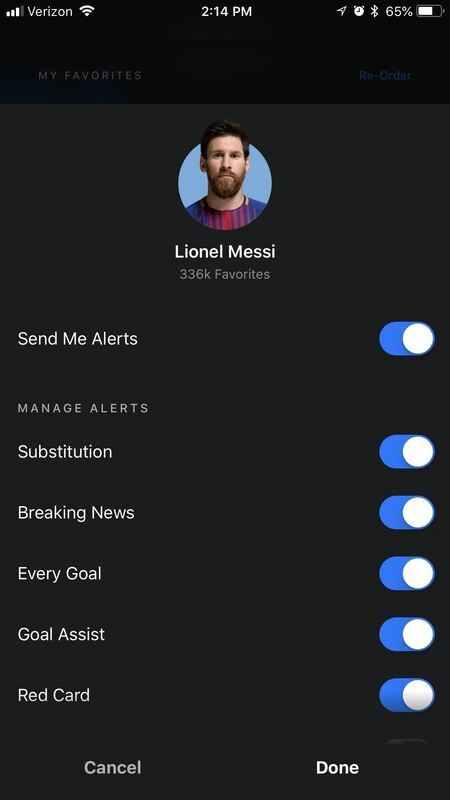 The biggest advantage it holds over apps like ESPN and Yahoo Sports is its rich notifications — you can follow any player or country and get custom alerts for breaking news, scores, and so much more. First, you'll need to install theScore. You can either manually search for it on the App Store (iOS) or Google Play (Android), or you can tap the link below to go right to it. Download and install it, then open it up. 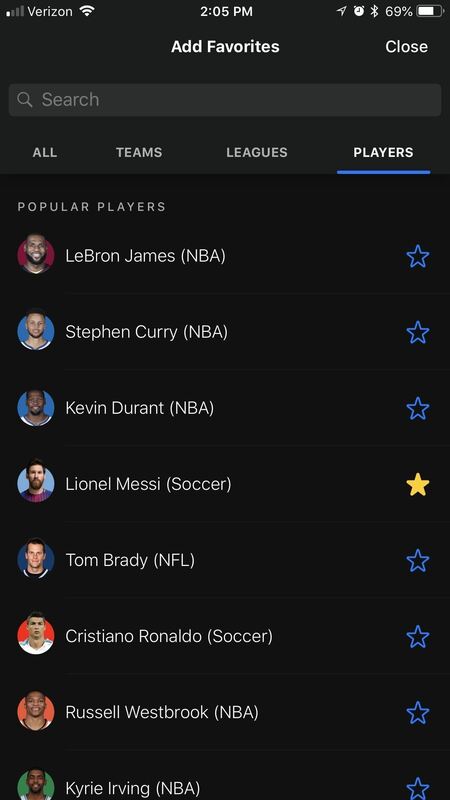 When you first open up theScore, you'll be asked if you want to make an account. You won't need to create one to follow the World Cup, but it's a good way to carry your preferences between devices. After that, you'll be shown a list of "Recommended" teams to favorite. 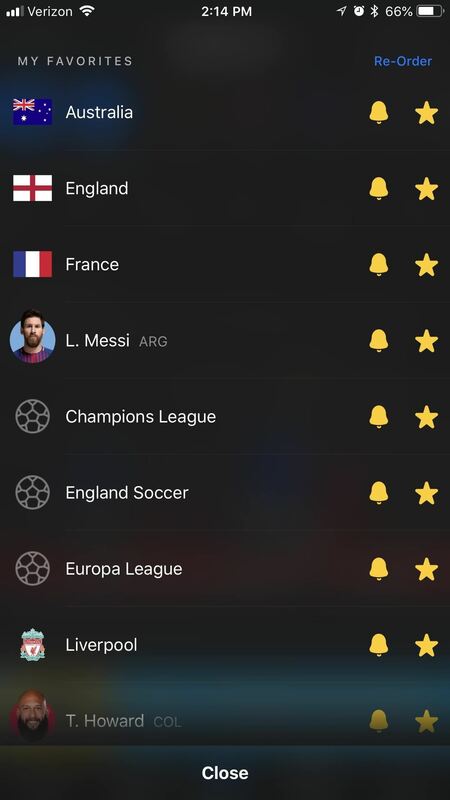 You'll get notifications for favorited teams, and their scores will be shown before others of the same league as well. 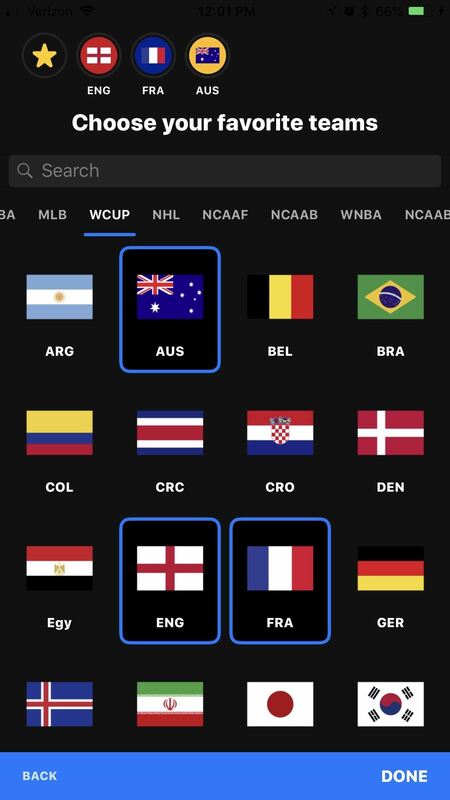 The Recommended tab will only offer local baseball, hockey, basketball, and football teams, so tap the tab that says "WCUP" to go to the World Cup teams, and choose any of the competing nations. You can choose as many as you want to follow. Favoriting teams works in the same way, as well as designating favorite players. 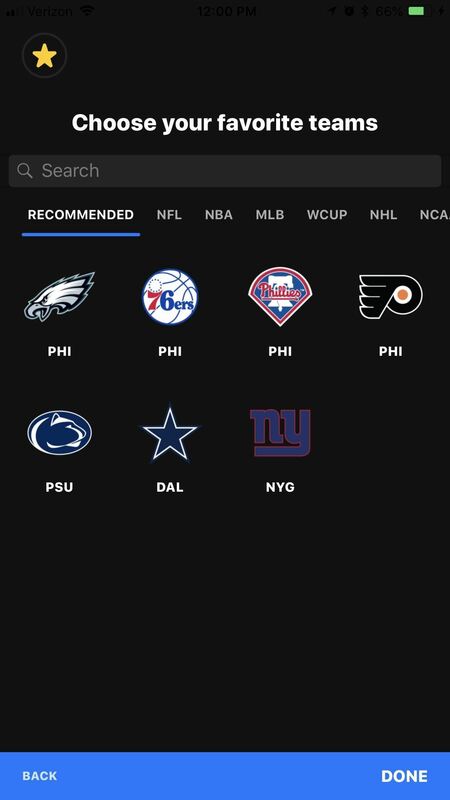 Don't be afraid to search for some lesser-followed teams and players — you can get updates for virtually anyone. 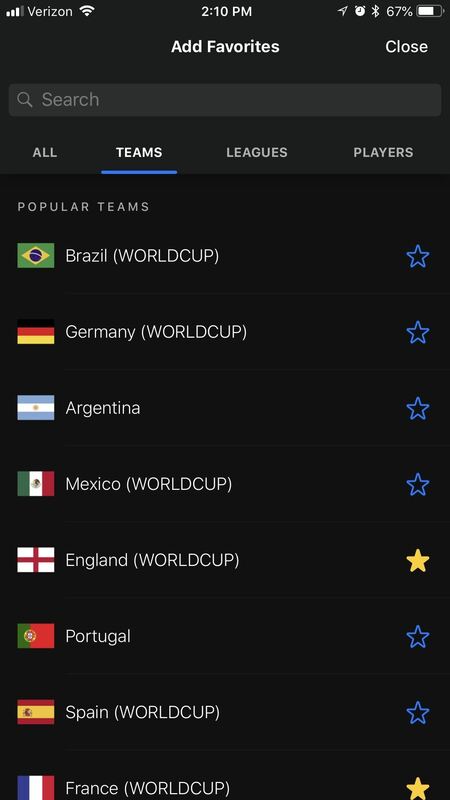 Now, tap on the "Favorites" tab from the home menu, and you'll see all your favorite teams and players along the top, but you'll still need to favorite the World Cup itself to get notifications for the whole thing. Tap "Manage" in the top-right corner, then the "Add" button at the top. 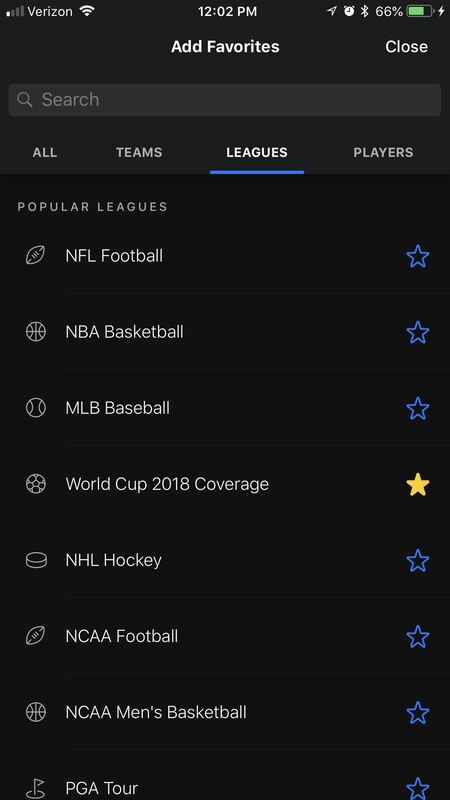 Now, select "World Cup 2018 Coverage" under the "Leagues" tab. 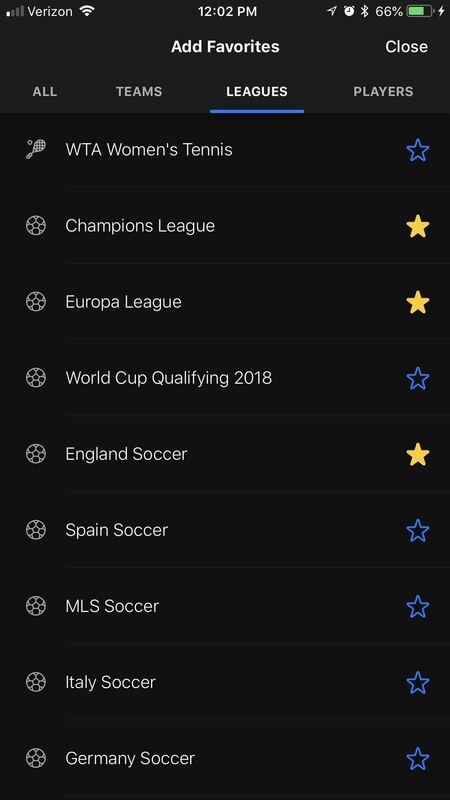 You can also choose more leagues, like the "Champions" or "Europa" by scrolling a bit. To determine what you'll be notified about, go back to the "Favorites" tab and tap "Manage" again. Now, tap the bell icon next to an item on the list to customize your alert preferences for it. With leagues (World Cupcoverage counts as a League), you'll can get major news alerts by turning "Breaking News" on. 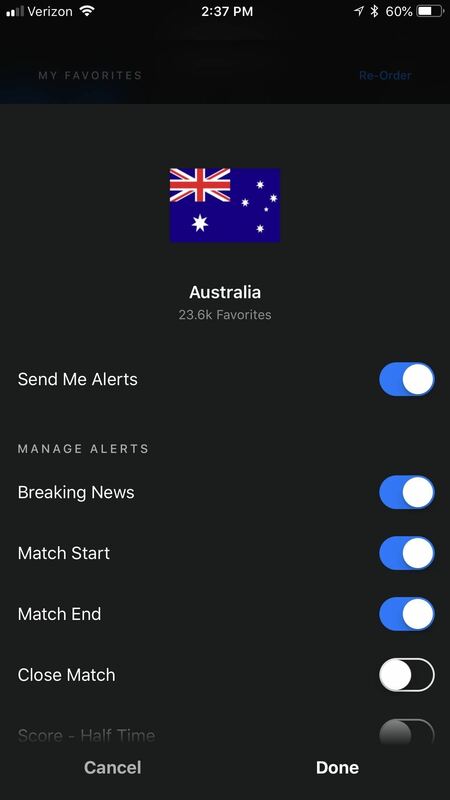 For teams, you can get all sorts of notifications like "Breaking News," "Match Start," "Red Cards," and more. You get similar options with players, though you get some more stats-oriented ones like "Every Goal" and "Goal Assist." If you ever want to switch off notifications for something, switch off "Send Me Alerts." Unfollow it by tapping the star icon next to the bell. Now you're all set to keep track of your favorite teams in this year's World Cup. 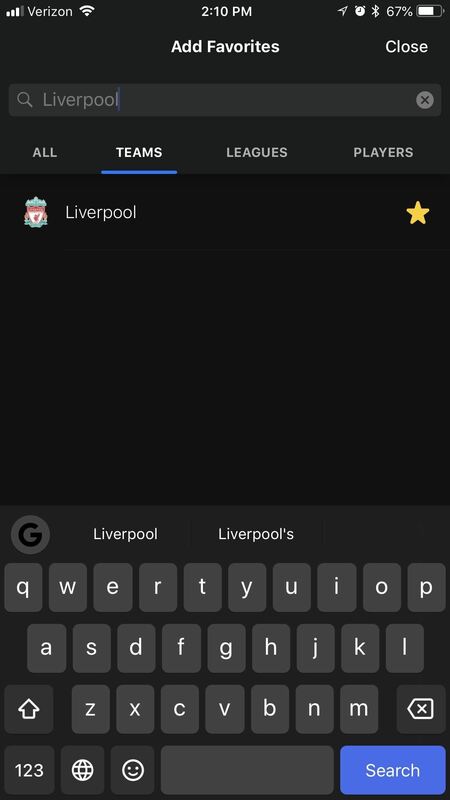 Keep in mind that theScore is a great app for keeping tabs on any team or league — not just the World Cup. Its granular notifications make it ideal for a large swath of fans, from casual to die-hard. Who are you rooting for in this year's World Cup? Let us know in the comments below.